Azure App Service provides a highly scalable, self-patching web hosting service. 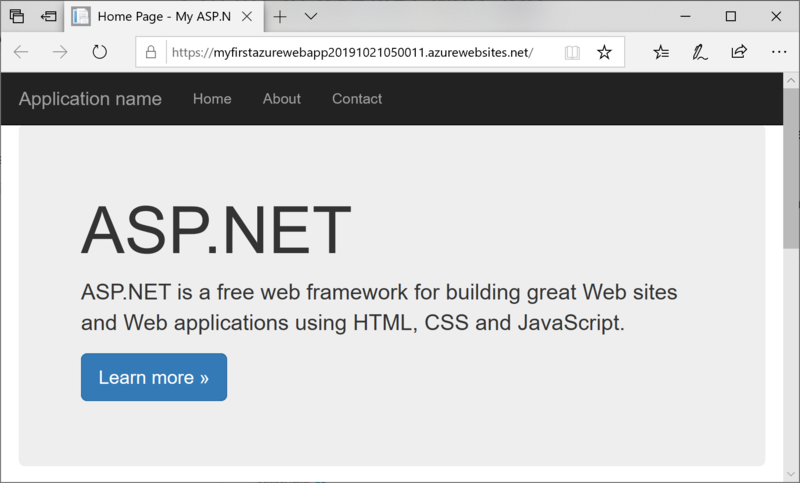 This quickstart shows how to deploy your first ASP.NET web app to Azure App Service. When you're finished, you'll have a resource group that consists of an App Service plan and an App Service app with a deployed web application. 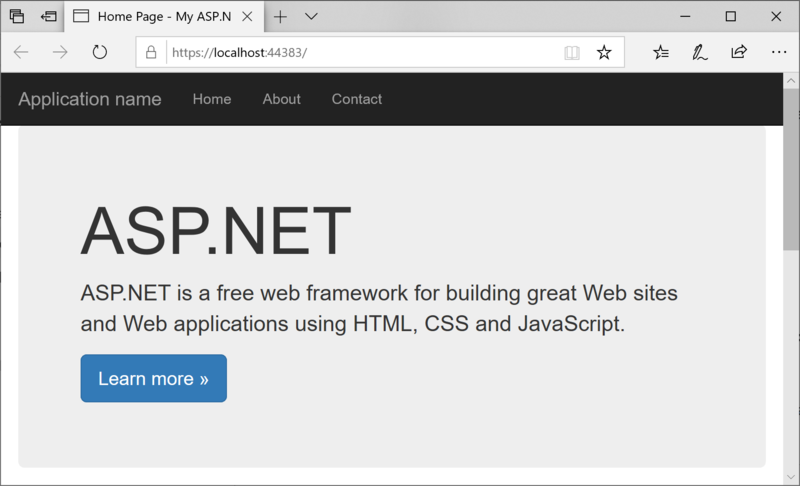 To complete this tutorial, install Visual Studio 2017 with the ASP.NET and web development workload. Install the latest updates in Visual Studio by clicking Help > Check for Updates. Add the workload by clicking Tools > Get Tools and Features. In Visual Studio, create a project by selecting File > New > Project. 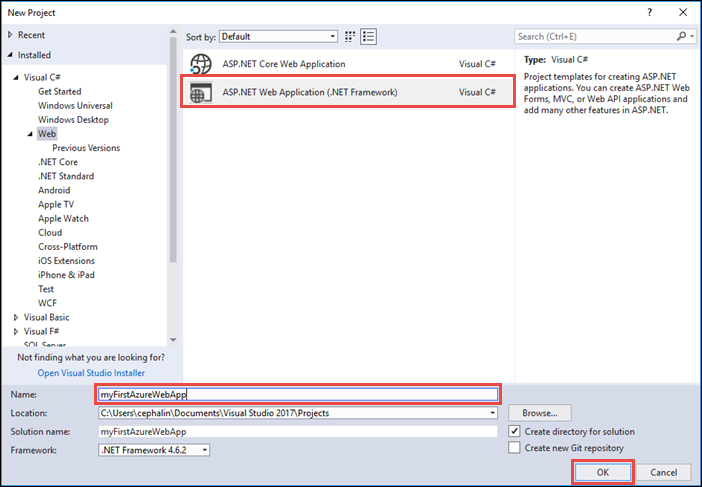 In the New Project dialog, select Visual C# > Web > ASP.NET Web Application (.NET Framework). Name the application myFirstAzureWebApp, and then select OK.
You can deploy any type of ASP.NET web app to Azure. 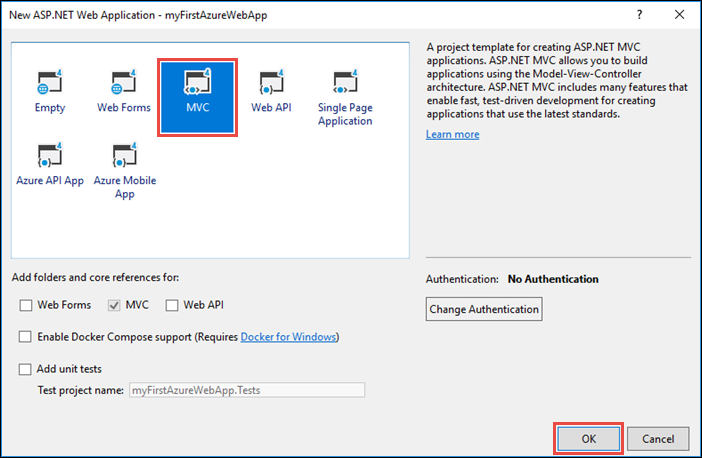 For this quickstart, select the MVC template, and make sure authentication is set to No Authentication. From the menu, select Debug > Start without Debugging to run the web app locally. 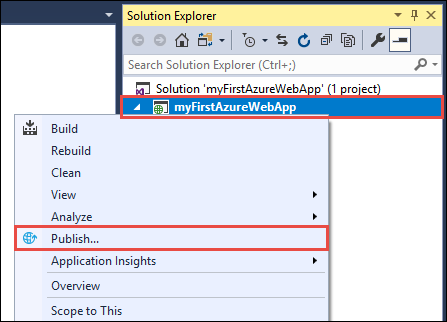 In the Solution Explorer, right-click the myFirstAzureWebApp project and select Publish. The publish wizard is automatically launched. Select App Service > Publish to open the Create App Service dialog. 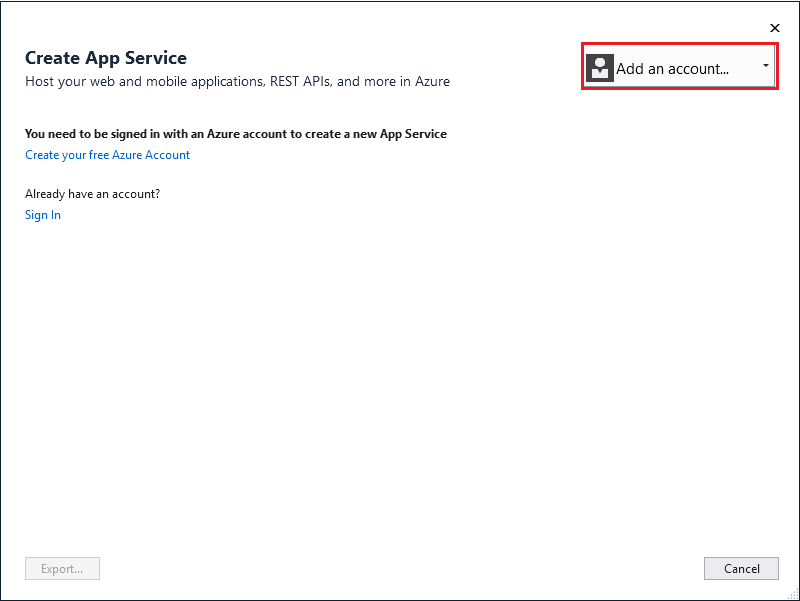 In the Create App Service dialog, select Add an account, and sign in to your Azure subscription. If you're already signed in, select the account containing the desired subscription from the dropdown. If you're already signed in, don't select Create yet. Next to Resource Group, select New. Name the resource group myResourceGroup and select OK.
An App Service plan specifies the location, size, and features of the web server farm that hosts your app. 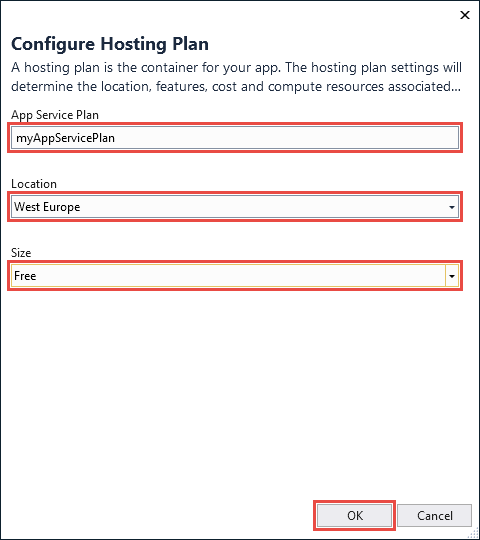 You can save money when hosting multiple apps by configuring the web apps to share a single App Service plan. Next to Hosting Plan, select New. In the Configure Hosting Plan dialog, use the settings in the table following the screenshot. App Service Plan myAppServicePlan Name of the App Service plan. Location West Europe The datacenter where the web app is hosted. Size Free Pricing tier determines hosting features. In App Name, type a unique app name (valid characters are a-z, 0-9, and -), or accept the automatically generated unique name. The URL of the web app is http://<app_name>.azurewebsites.net, where <app_name> is your app name. Select Create to start creating the Azure resources. Once the wizard completes, it publishes the ASP.NET web app to Azure, and then launches the app in the default browser. The app name specified in the create and publish step is used as the URL prefix in the format http://<app_name>.azurewebsites.net. 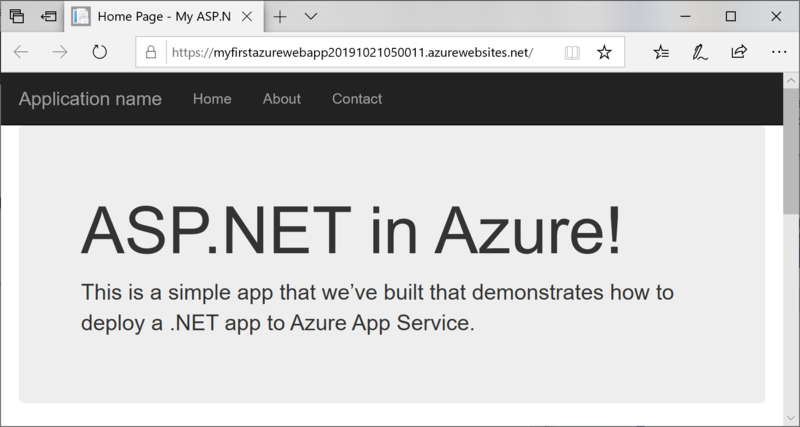 Congratulations, your ASP.NET web app is running live in Azure App Service. From the Solution Explorer, open Views\Home\Index.cshtml. To redeploy to Azure, right-click the myFirstAzureWebApp project in Solution Explorer and select Publish. On the publish page, select Publish. When publishing completes, Visual Studio launches a browser to the URL of the web app. 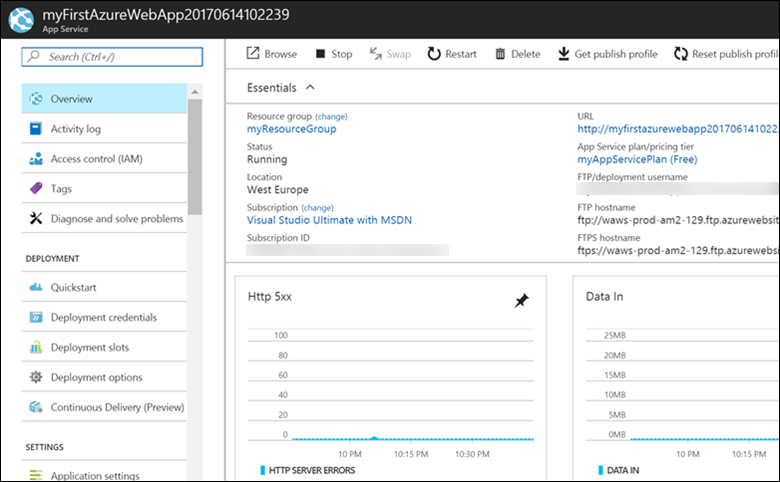 Go to the Azure portal to manage the web app. 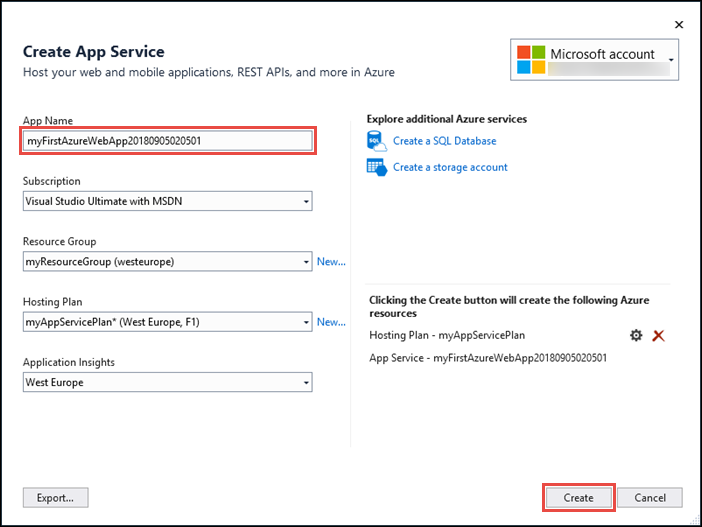 From the left menu, select App Services, and then select the name of your Azure app. 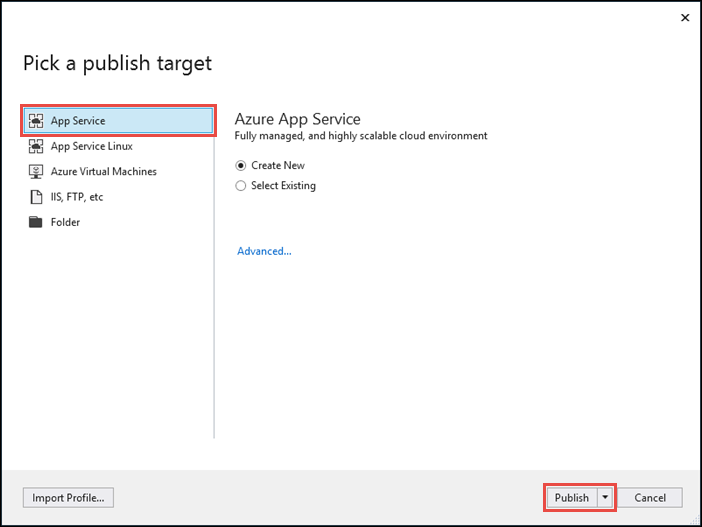 Watch the video to see this quickstart in action and then follow the steps yourself to publish your first .NET app on Azure. In the preceding steps, you created Azure resources in a resource group. If you don't expect to need these resources in the future, you can delete them by deleting the resource group. From the left menu in the Azure portal, select Resource groups and then select myResourceGroup. On the resource group page, make sure that the listed resources are the ones you want to delete. Select Delete, type myResourceGroup in the text box, and then select Delete.